Developed by SunGard Higher Education, PowerCAMPUS Self-Service is an Internet software system designed to provide students, faculty, administrators, and other members of an educational institution’s learning community with “anytime, anywhere” access to information services. PowerCAMPUS Self-Service leverages the information management capabilities of the PowerCAMPUS administrative software system. For more information about PowerCAMPUS, go to the OWU PowerCAMPUS self-help page. Faculty, advisors, and departmental staff – Please visit the Self-Service for Faculty page. Students should see the Self-Service for Students page. 1) Make sure you are in the Section Search NOT the Course Catalog. The Course Catalog will not show you the schedule information you need to register. Be sure to select Period 2012 Fall. If you want to see full module, first module, and second module courses, leave the Session drop down blank. Otherwise you may use this option to refine your search. From the Section Search page, you may also increase the number of results per page by clicking the drop-down tab in the lower right side of the page. 2) Keywords Search – This section is designed to help you locate a course for which you do not have a course code. Keep the search criteria brief as many course titles have been shortened to fit the space provided in OWU Self Service. For example, try entering “intro” instead of “introduction” or “psyc” instead of “psychology”. Typing in a course code here will not give you a listing of all courses in that department. It will give you a list of courses with your criteria in the title or course description. See the Course Code search option for this type of query. 3) Course Code Search – This query is designed to provide you with a way to look up courses by the alpha numeric course code (e.g. PSYC 210). You may also do a general search for “PSYC” to call up all courses listed under that particular department. If you are unsure of the alpha code used for a particular department you may use the Department search located under the Advanced Search tab. 5) Refine Search – Use this menu option located on the left side of the screen if you would like to add or subtract criteria from your search. This will prevent you from having to enter all criteria a second time. 6) New Search – Once you have completed your first search, you will be able to select the option, New Search located on the left side of your screen. This will start a new search process. 7) Results Per Page – Clicking on the drop down tab under “Results Per Page” on the left hand side of the page gives you the option to increase the number of results per page from 10 up to 100. This makes scrolling through long lists of courses much easier. How to I Find Textbooks for a Class? 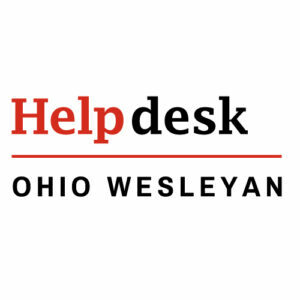 You do not have to be logged in to OWU Self-Service to find textbook information for a class. Go to campus.owu.edu and click the Search tab along the top. Click the Section Search link that appears below the tabs. Click the Textbook Search link that appears on the left. A Textbooks window will open. Select the Term, Year and Department for the class you’re interested in. The list of classes displays automatically once you’ve made your selection. Click on the course ID or Title link to see a list of textbooks for that course with ISBN and price. If you see the message “No sections with ordered textbooks were found…” you will need to contact the instructor for the course and ask them about textbooks. When you’re done, simply close the Textbooks window.